While you can control the intensity of the spice in Broiled Chicken Thighs with Chipotle Sauce, it is not a dish for the meek palette. Roasted red peppers and spicy, smoky ground chipotle chiles make this sauce a knockout. A fan of saucy, rather than dry dishes, I doubled all of the ingredients except the chicken and the olive oil in the sauce. In fact, I quadrupled the amount of garlic and chipotle chili!Knowing our gas oven broiler is not the strongest, I opted to sear the thighs in a little olive oil over a medium-high burner on the stove top for several minutes on each side until browned. I then put all of them on a foil lined baking sheet in a 4oo degree oven for another 15 minutes. So now you have two choices: broil as indicated in the directions below, or sear and bake as mentioned above. I prefer to mash garlic and salt in a small mortar as opposed to using the side of a chef’s knife. Chicken thighs get happy in the seasoning mixture. 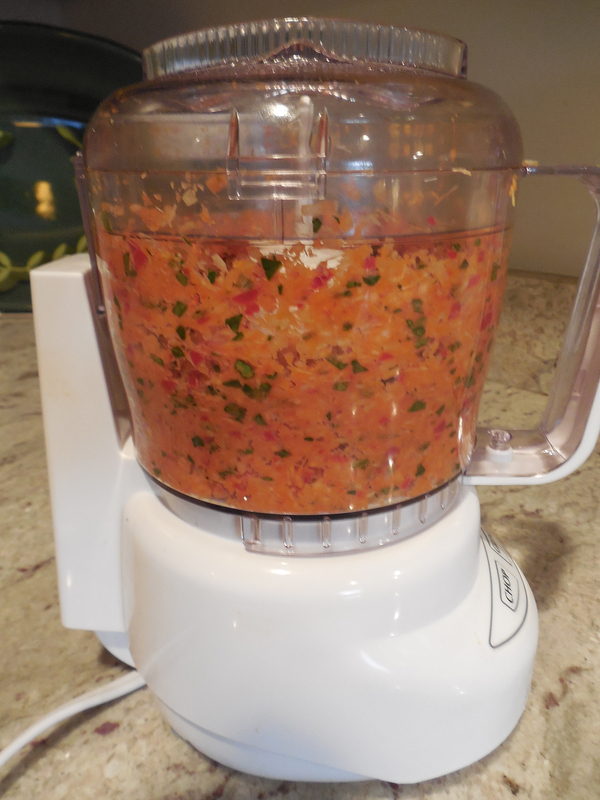 The chipotle and red pepper sauce after it is puréed in a mini-blender. The chicken was seared on both sides for a few minutes before going into a 400 degree oven for 15 minutes. A cooked thigh lies on top of a schmear of the chipotle sauce and is garnished with fresh cilantro. Position a rack about 6 inches from the broiler and heat the broiler on high. In a small bowl, combine 1 tsp. of the cumin, the sugar, 1/4 tsp. of the chipotle, the cinnamon, and 1 tsp. salt. In a medium bowl, toss the chicken with 1 Tbs. of the oil, and then toss with the spice mixture. Arrange the chicken on a rack set over a rimmed baking sheet lined with foil and broil until the chicken browns lightly on top, about 5 minutes. Flip the chicken and continue to broil until browned and cooked through, about 5 minutes more. Meanwhile, coarsely chop the garlic and sprinkle it with 1/4 tsp. salt. Using the flat side of a chef’s knife, smear and mash the garlic and salt together to form a coarse paste. Transfer the garlic paste to a food processor and add the roasted red pepper, the remaining 2 Tbs. oil, the remaining 1/2 tsp. each of cumin and chipotle, and 1/2 tsp. salt. Purée into a smooth sauce. Garnish the chicken with the cilantro and serve with the sauce. Serve with roasted potatoes, egg noodles, or polenta. A cooked chicken thigh shown plated another way with a side of cheddar polenta. Carmelizing onions for a burger topperThe nutrient content of this once wild game animal is very similar to ground turkey. Be aware, it has a higher sticker price because there is less of it, and cost more to produce. If you are a meat eater, or love red meat and perhaps have stopped because your doctor told you to give it up, you might want to consider bison (or buffalo) meat as your once a month treat. It is tastier than beef and richer in flavor. Bison is a great source of nutrients, it has the basics: zinc, niacin, iron, vitamin B6 and selenium. Anywho, we thoroughly enjoyed ours (cajun-seasoned of course) despite being too well done, topping them with a slice of Buffalo Wing NY Chipotle Cheddar Cheese, caramelized onions, a slice of tomato and lettuce greens. And what’s a burger without fries? 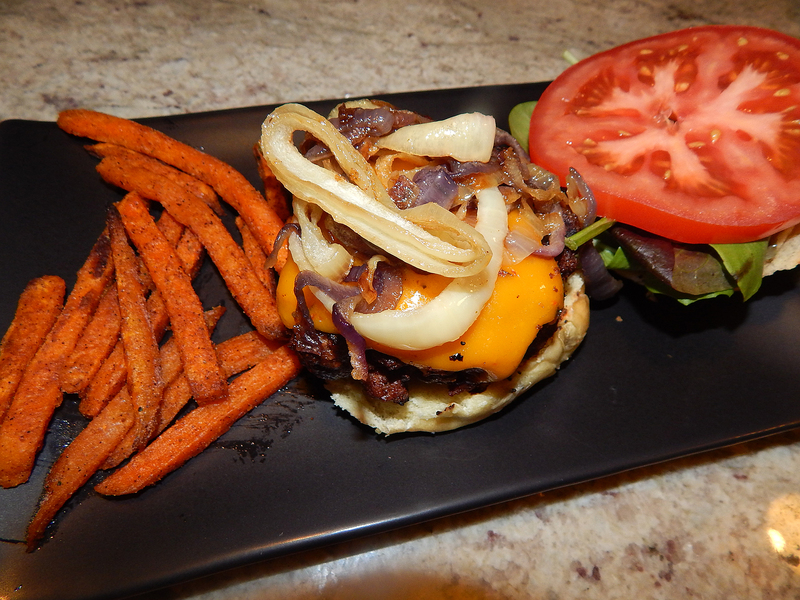 How about a healthier take with the Alexis Chipotle Spicy Sweet Potato Oven Fries. Even if it’s not a game day, you’ve still got game in the kitchen when you make this finger-licking, umami-laden take on chicken wings. The recipe calls for slow cooking the wings until the meat is almost falling-off-the-bone tender, then broiling to make them brown, crisp, and irresistible. It’s supposed to be one extra step that’s well worth it, but ours didn’t end up all that crispy. My preference is for very crispy wings, which I think you can only get when you fry them—not necessarily a healthy choice. If I can figure out a way to keep this wonderful flavor, but crisp up the chicken pieces even more (without deep frying), we’d have a winner! 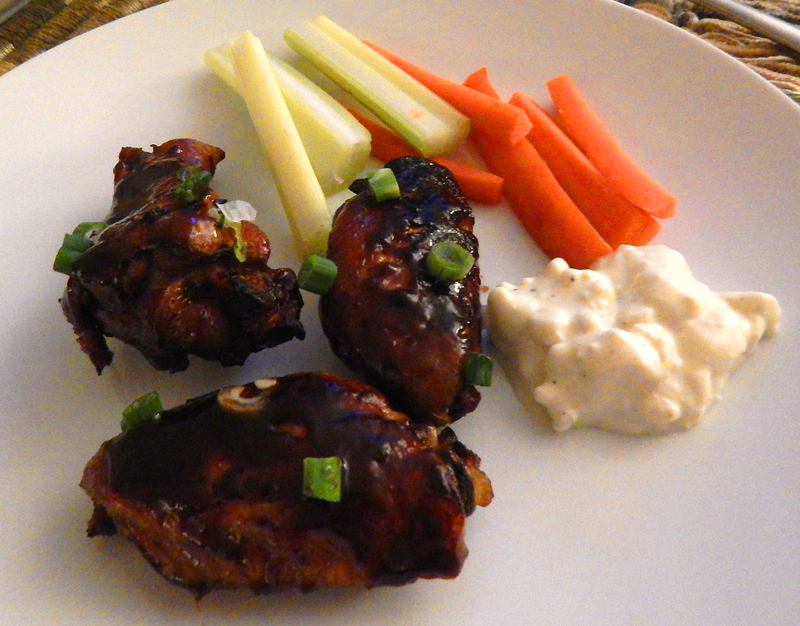 I’m afraid if you broil the wings too much longer than called for, they would only blacken and char—not a good end result. 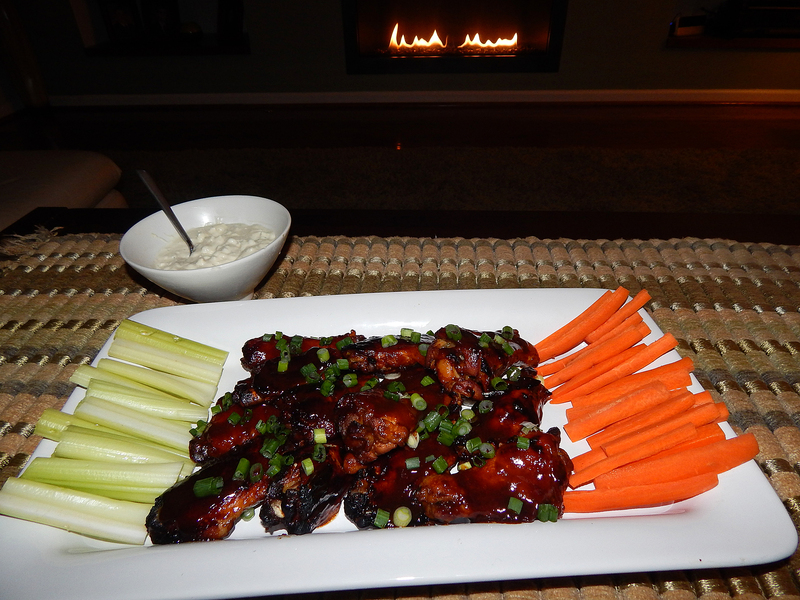 It was Superbowl Sunday when we made this appetizer. So earlier in the day, we threw everything in the slow cooker, turned on low, and left to go see a movie. When we got back several hours later, the house smelled wonderful! The directions call for boiling the defatted sauce for 15 minutes to reduce by half. We found it took about 3 minutes longer to produce the proper consistency. Finishing four hours in the crock pot. Boiling the sauce to reduce by half. Brushing second side with sauce to pop back under the broiler. Well, at least our wings were a winner, if not the crispest! Served with celery and carrot sticks, and chunky blue cheese dressing. 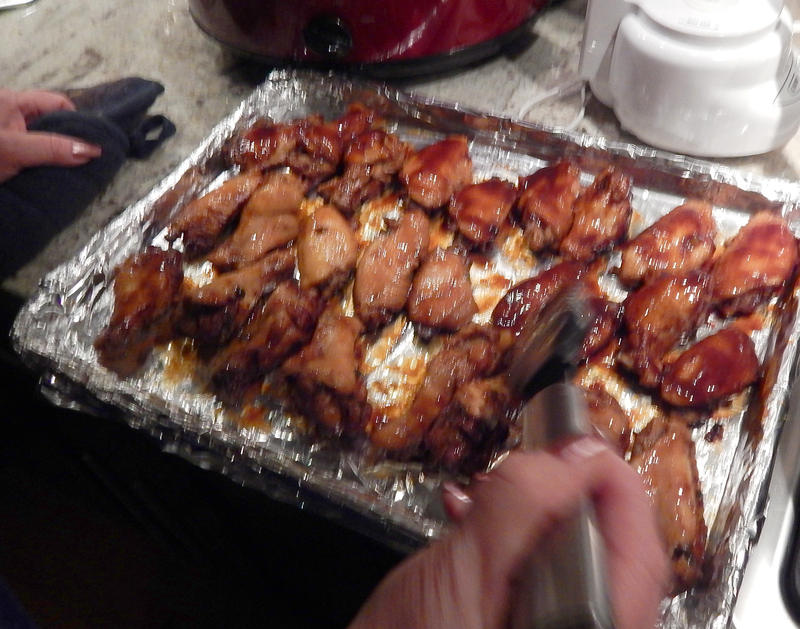 Use tongs to transfer the chicken wings to a large foil-lined rimmed baking sheet. Strain the sauce into a fat separator and set aside for a few minutes. Pour the defatted sauce into a 2-quart saucepan, add the vinegar, and boil over high heat, stirring occasionally, until reduced by half, about 15 minutes. Position a rack 4 inches from the broiler element and heat the broiler on high. Brush the wings with the sauce and broil until browned, about 3 minutes. Turn the wings over, brush them again, and broil until browned and crisp, about 3 minutes more. Brush with the sauce once more before serving, topped with the remaining 2 Tbs. scallions and drizzled with the chile oil, if using. (We did’t have this ingredient, so obviously we omitted it.) Serve any remaining sauce on the side for dipping. Enjoyed at bars all over Spain, this tapa is often singled out as an exemplary fusion dish: a Moorish marinade applied to pork, the quintessentially Spanish meat. 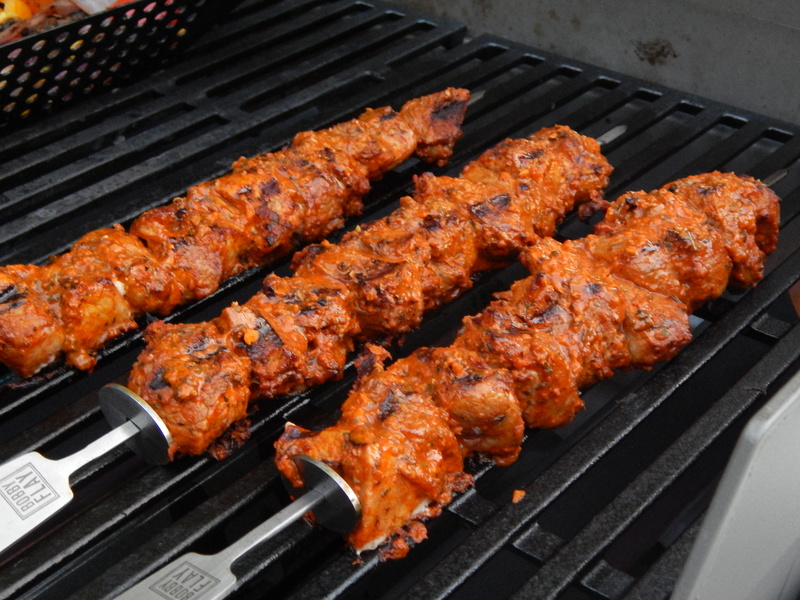 The kebabs are wonderful and taste equally good made with pork, lamb, or chicken. Feel free to thread cherry tomatoes, chunks of red bell pepper, or pieces of fruit, such as honeydew melon or green grapes onto the skewers too. 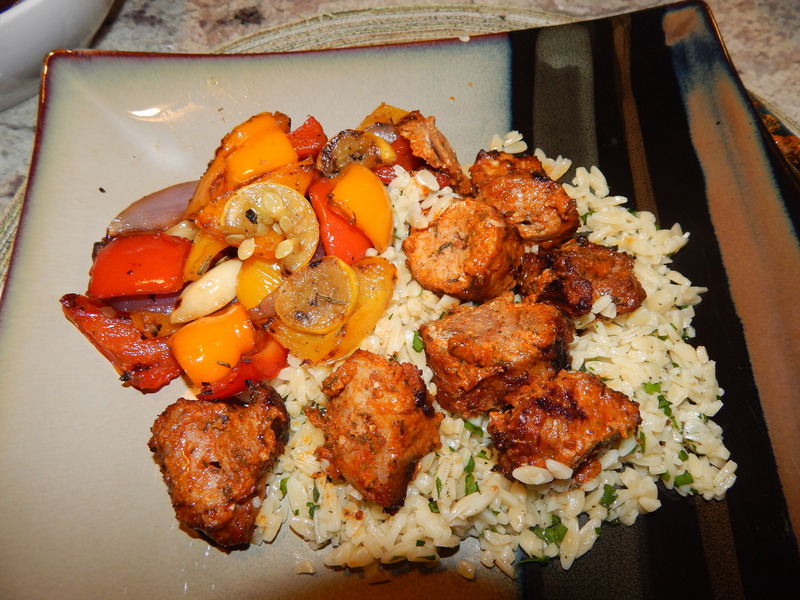 We paired our kebabs with orzo seasoned with chopped fresh chives and flat-leaf parsley and a really good olive oil. A favorite go-to side dish, our vegetable accompaniment was a mix of cut-up fresh vegetables including red, yellow and orange bell peppers, button mushrooms, red onion, and yellow summer squash which had been marinating in olive oil, roasted garlic, fresh rosemary and salt and pepper. After marinating in a ziploc bag for a couple of hours, throw them into a heated grilling basket, turning often until done, about 20-25 minutes. 1. Place the onion, garlic, sweet and hot paprikas, 2 teaspoons of the salt, the oregano, peppercorns, thyme, cumin, cinnamon, bay leaf, vinegar, wine (if using) and olive oil in a mini food processor and process to a paste. 2. 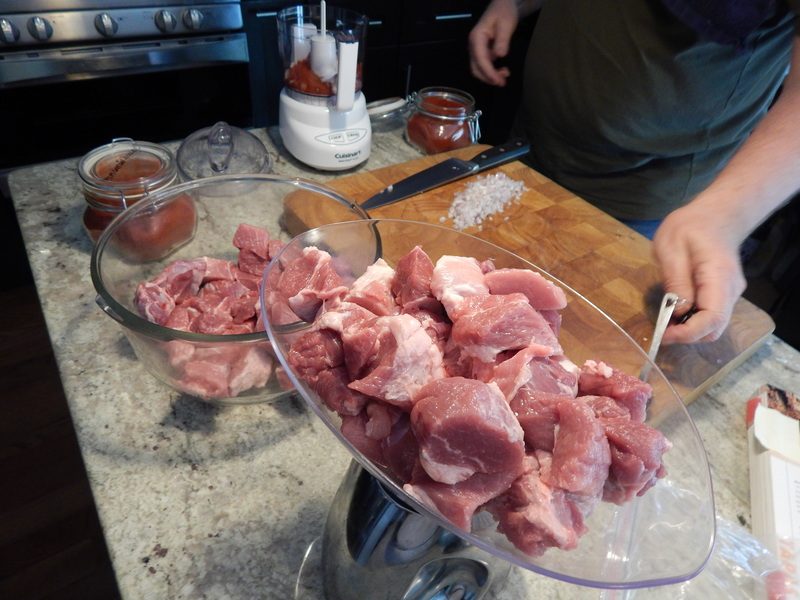 Place the pork in a bowl and rub a little salt on it. Scrape the marinade into the bowl with the meat and toss to combine thoroughly. Cover the bowl and refrigerate the pork for 4 to 6 hours, tossing a few times. Let the meat come to room temperature before grilling. 3. Soak 16 bamboo skewers in water for 30 minutes. 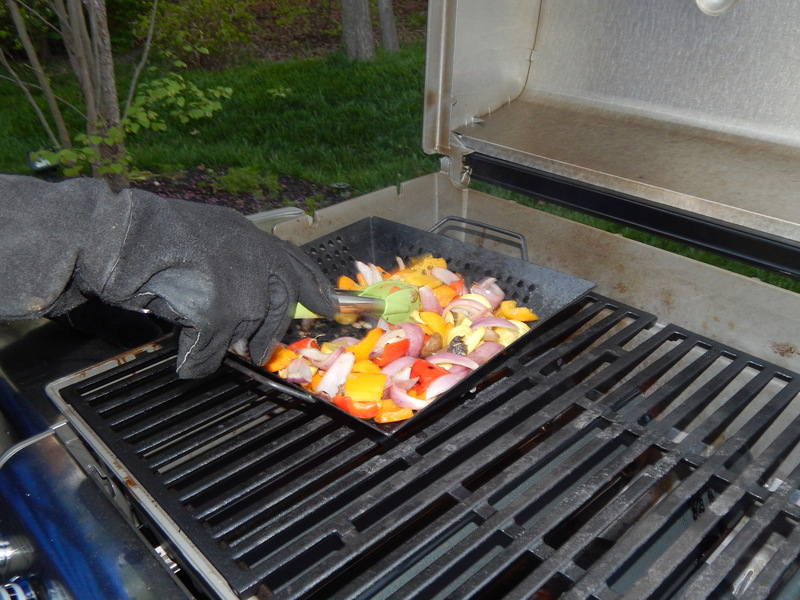 Light the grill and preheat it to medium-high or preheat a large ridged grill pan to medium-high over medium heat. 4. 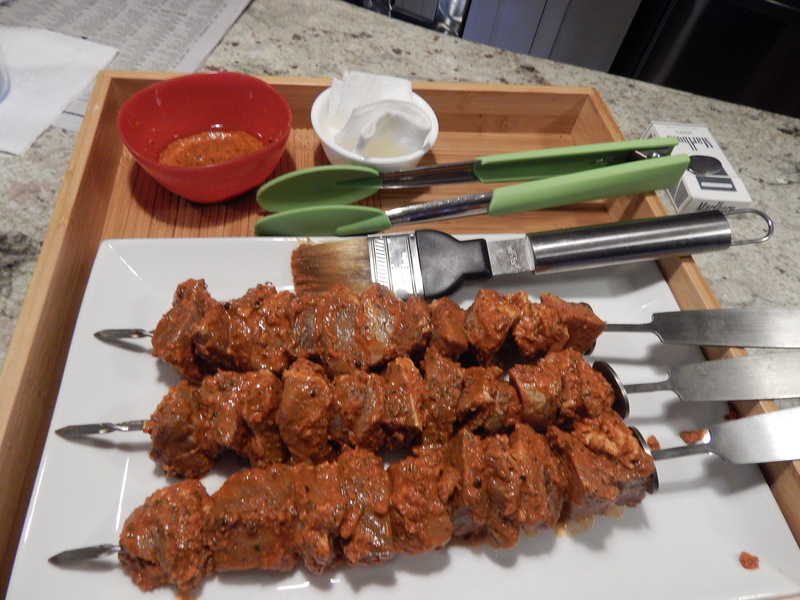 When ready to cook, thread the meat onto the skewers and brush it with a little olive oil. 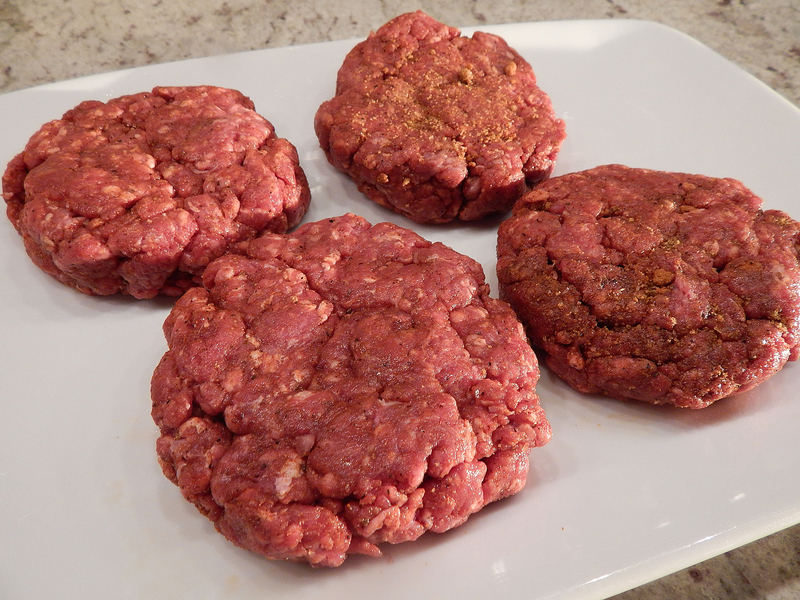 Cook the meat, brushing with olive oil and turning once, until it is just cooked through, 5 to 7 minutes. (If you are cooking lamb, and would like it medium-rare, don’t cook it quite so long.) Serve the kebabs at once. Serves 8 as a tapa, 4 as a light main course. 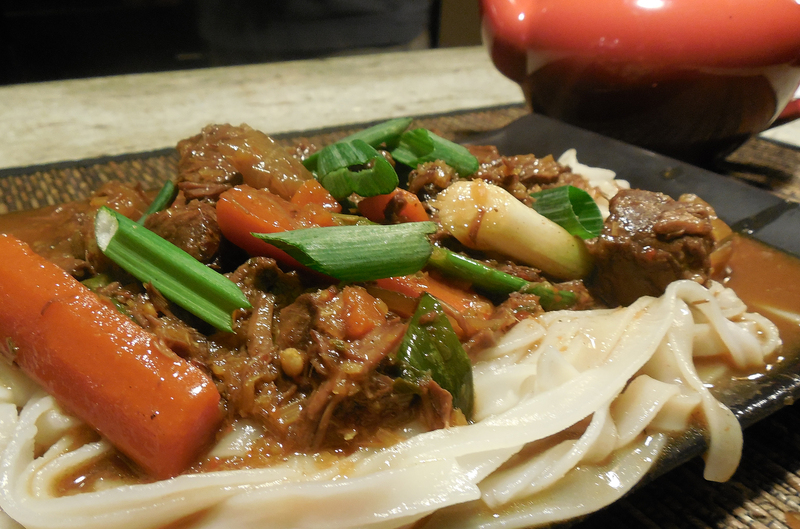 Plated dish of Thai beef stew with lemongrass and rice noodles. As promised, here is the recipe for Thai Beef Stew with Lemongrass and Noodles found in the February 2014 issue of Bon Appétit. In this soul-satisfying dish, delicate rice noodles are combined with gingery spiced beef. And it was really, really good! 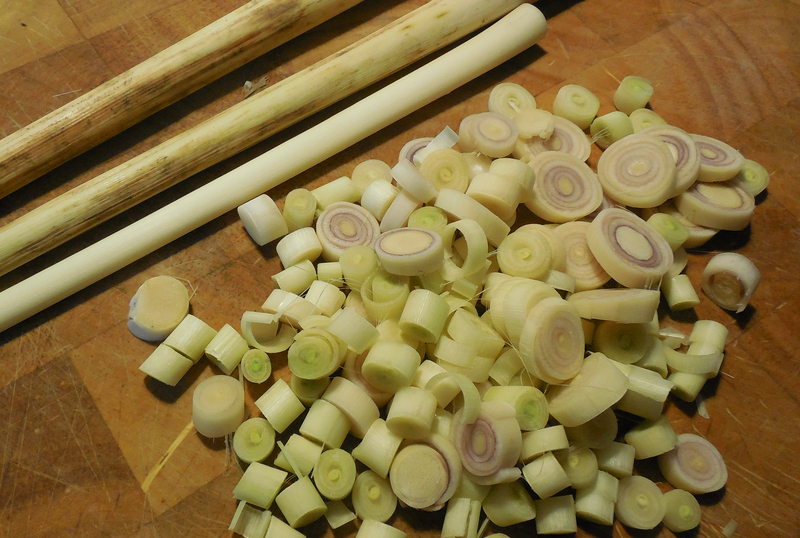 When purchasing lemongrass, look for firm stalks (not soft or rubbery, which means it’s too old). Lower stalk should be pale yellow (almost white) in color, while upper stalks are green (do not purchase if outer leaves are crusty or brown). Usually fresh lemongrass is sold in groupings of 3-4 stalks, secured with an elastic band. Stalks are approximately 1 foot long (or more). If you can’t find it with the fresh produce, check the freezer section – lemongrass stalks are also sold in frozen packets. I have also found it in tubes, as a paste, by the packaged fresh herbs. But if at all possible, fresh is best. 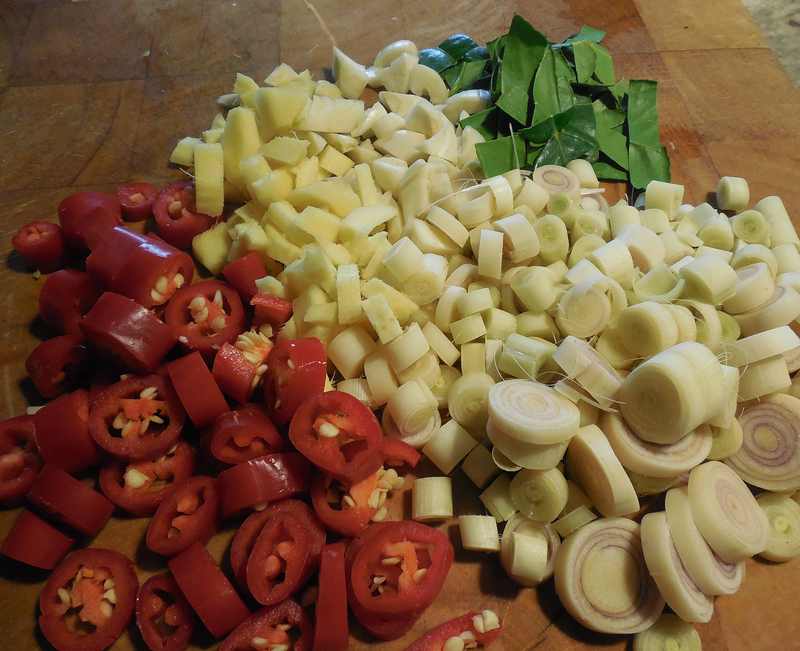 Chopped Thai peppers, garlic, ginger, kaffir lime leaves and lemongrass. Cook lemongrass paste in same pot, stirring often, until lemongrass is beginning to soften, 5–8 minutes. 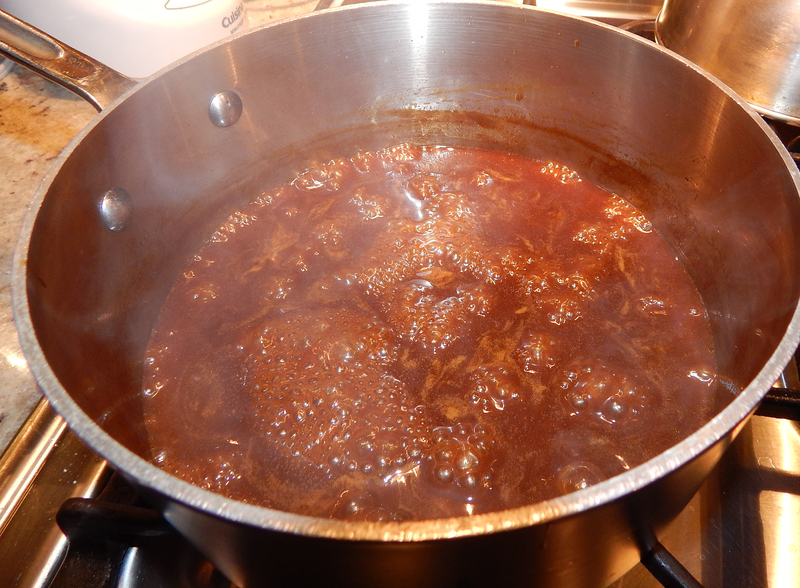 Add star anise, cinnamon, soy sauce, fish sauce, brown sugar, beef with any juices, and 10 cups water. Bring to a boil, reduce heat, and simmer, partially covered, skimming occasionally, until beef is tender and liquid is slightly thickened, 2½–3 hours. Recipe by Alison Roman.OUR TWIST: Since neither of us like coconut (but strangely we both like coconut milk), we omitted this step. 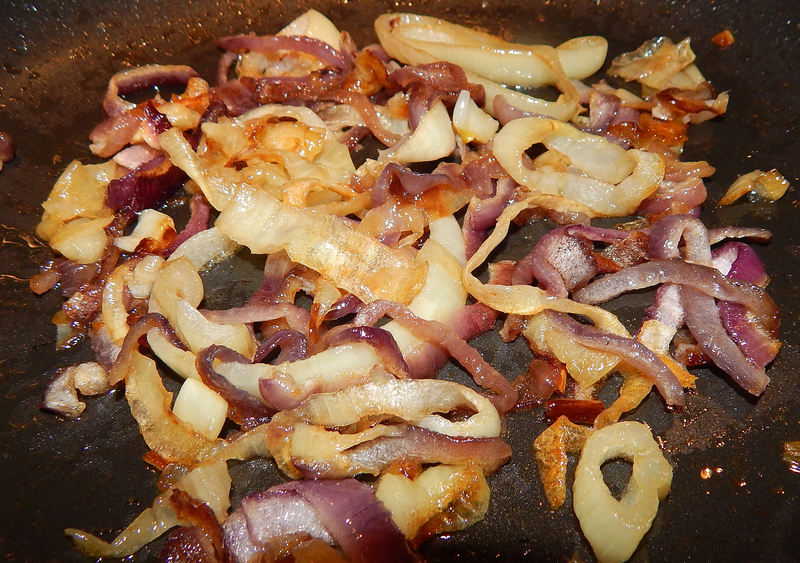 Plus, I only had two shallots on hand when making this recipe so I substituted a sweet vidalia onion in place of the two remaining shallots. Toward the end of the cooking time, we both felt that the broth was too thin and watery and we wanted to thicken it somewhat. Enter the fact that we both like coconut milk — so I made a slurry of the milk and cornstarch and added it to the simmering stew until it was the consistency we wanted. Another article reported Pennsylvania State University’s research examined the link between peoples’ personality types and whether they were fans of food packed full of hot spices such as chilli. It found that people who seek adventure and intense sensations like spicy food more than those who avoid risky situations. While I admit, I use to love roller coasters, whitewater rafting, riding in glass elevators, and racing around on motorcycles (back then with out helmets! ), seeking those adventures have lost some of their appeal over the years. And I wasn’t brought up with a lot of spicy food either. In fact, most meals my mom made were lightly seasoned and not at all zesty. But as a child I often gravitated toward hot spicy candies like Red Hots, Hot Tamales, Brach’s Cinnamon Hard Candy, and Dentyne Fire Gum. Only food prudes are afraid to dabble with a little hot sauce occasionally. And for me, I suppose it wasn’t until I left for college and became exposed to a more exotic palette of food at the University of Michigan, Ann Arbor that I actually made a conscious effort to seek out zingy food such as Mexican and Indian cuisines. And thus began my life-long passion for hot peppers. A recent article in the Washington Post laid out the five influences on how people taste food. Typical extreme hot sauces, favorites of benign masochists everywhere, run up into the hundreds of thousands of Scoville heat units—that bottle of Tabasco in your kitchen is only 5000, tops. And I crave spicy food! So in honor of my penchant for all things spicy, I recently cooked a few savory dishes found in my February 2014 issue of Redbook. With the sriracha chicken recipe, I used a combination of legs and breasts. For the most intense flavor, I marinated the chicken overnight. And since the pieces were on the large size, we cooked them for about 45 minutes. Finished Sriracha Chicken, legs and breasts. In a medium sauce bowl, whisk together all of the ingredients, except the chicken. Reserve a ¼ cup and set aside. Add the rest of the sauce to the chicken pieces in a Ziploc bag, seal and refrigerate for at least an hour, but preferably overnight. 2. Heat oven to 425 degrees with a rack positioned 4 inches from broiler. Spray a rimmed baking sheet with cooking spray. 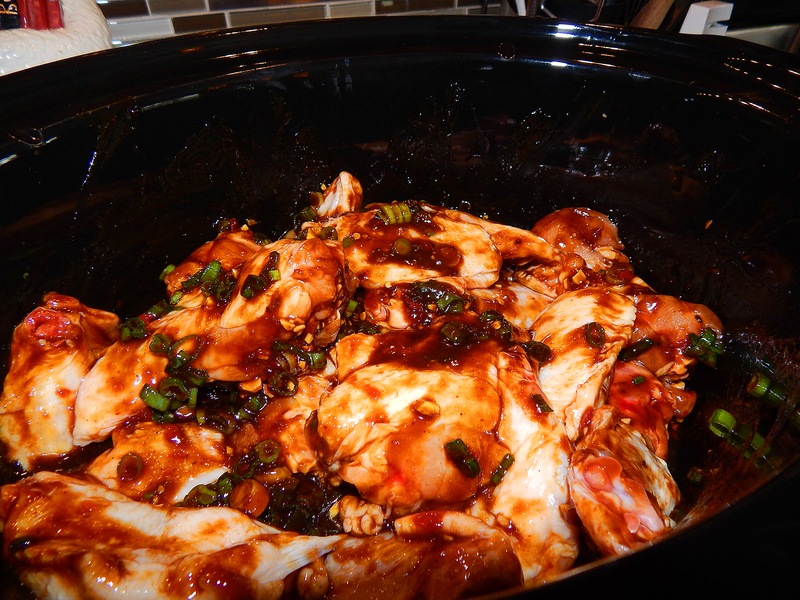 Remove chicken from marinade and arrange on baking sheet in a single layer, skin side up. Bake until chicken registers 165 degrees on a meat thermometer, 20-40 minutes depending on the size of the chicken pieces. Brush Chicken with reserved marinade. Increase heat to broil and continue cooking until skin begins to brown, about 3 minutes. 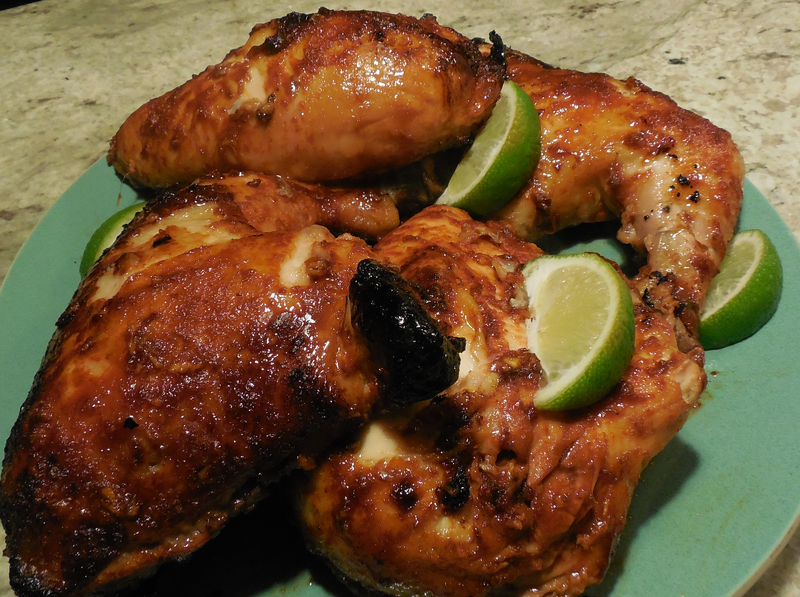 Serve chicken with cilantro and lime wedges. Spicy orange salmon with wasabi sauce — exquisite! Heat broiler with rack set 4 inches from heat. Spray a baking sheet with cooking spray. Place salmon, skin side down on sheet. Mix together orange zest, salt, sugar and cayenne and rub over salmon flesh. Place under broiler until fish begins to turn brown and is cooked through, about 8-10 minutes. Meanwhile, place yogurt, orange juice, wasabi paste and scallions in a blender and puree until smooth; season with salt. 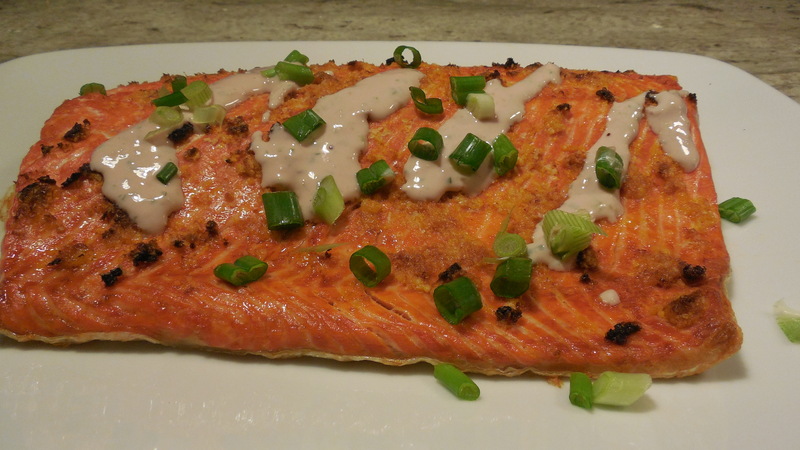 Slice salmon into 4 portions and serve with rice topped with wasabi sauce and scallions. *Since I had several blood oranges on hand (see my Blood Orange blogBlood Orange blog), I substituted the zest and juice in this recipe for that of the blood oranges, which I think gave it more intense color and flavor. 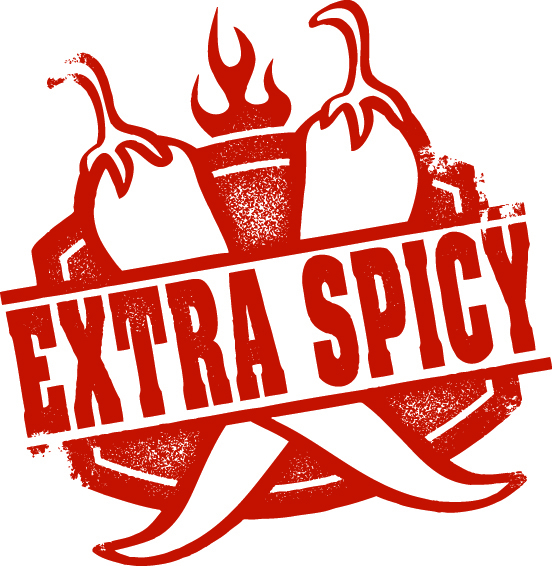 Will definitely be posting more on “all things spicy” in the future. 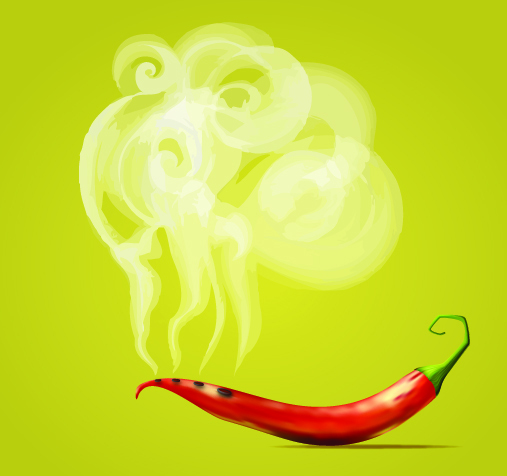 If you have a favorite spicy recipe, I’d love to hear from you! 1/2 -3/4 c srircha sauce??? We were in Jamaica last year and found a hot sauce that we put on everything! Well, I did anyway. Yes It is a LOT of sriracha, but you can adjust according to taste. It is soooo good!